My 11 year old daughter took this (somewhat cut off) photo of a maypole in Mittenwald, Germany , because she thought it was pretty. She didn't know what it was. Dancing around a maypole is a lovely celebration that I was happy to explain to her and my son. May Day, or May 1st, has been a traditional day of festivities for many centuries, and nowadays is most zealously celebrated in the Germanic European countries. In many places it is a public holiday, which is important to know if you're a tourist because banks and museums may be closed, but also because various cultural activities may be available for you to enjoy. Many of the May Day folk traditions include children and are especially entertaining for young visitors to a new country. Maypoles are erected on May Day and decorated according to local customs. For example, in Bavaria, Germany, they are designed with emblems depicting regional crafts or industries, and in England with garlands, painted stripes, flowers and flags. Towns then usually hold a procession with perhaps a brass band, folk music and singing or a carnival. Often a May Queen is chosen from the population of young women and she may be the one to officially commence the maypole dancing. Traditionally, the dancers, often children, gather in a circle around the maypole, each holding a colored ribbon attached to the pole. As the dance begins the ribbons are intertwined and wrapped around the maypole. The dancers can then retrace their steps to unravel the ribbons, and the singing and merriment go on all day. Depending on the local custom, the maypole may remain in place until the end of May, or, in Bavaria for example, may remain permanently, such as the one we photographed above in July. 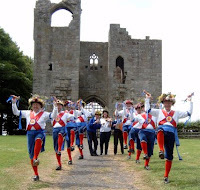 In England, May Day celebrations include Morris dancing, a traditional form of lively folk dancing performed by groups of men and women, often accompanied by accordion or fiddle playing. Morris dancers often dress in traditional folk costumes or sometimes silly costumes when they perform at events. As a child in Catholic school, every May Day we would pay homage to the Virgin Mary by adorning her with spring flowers and saying the rosary, and this is what my mother remembers from her youth in a small German village as well. This custom is still practiced in many European towns. Thanks so much for that fun info, Katja! I've never heard of stealing the Maypole! I agree with your daughter: the Mayday pole is very pretty. It also sounds like a fun tradition. I think in many of these countries any excuse to celebrate the end of winter is a good idea. Just found an interesting site on wikipedia: http://de.wikipedia.org/wiki/Maibaum If you speak German you could read it there (or just throw it in the google translator). Was looking for the little video we saw last Sunday, but it doesn't seem to be on the internet anymore :-(. I'll keep searching though. Thanks Katja! I'll check that out!